This is an easy Divine Mercy fruit platter to make, reflecting the rays of mercy. Just place fruit on skewers to reflect the red blood ray (strawberries) and blue pale water (blueberries) rays of Divine Mercy. I also used bananas to add to the pale rays that stand for water. You often see white mixed in with the blue rays to the far right of the image. You can certainly opt out of the banana skewers and just use strawberries and blueberries for the 2 rays only. I then trimmed my skewers to fit nicely on the platter I had. "Let the rays of grace enter your soul; they bring with them light, warmth, and life." 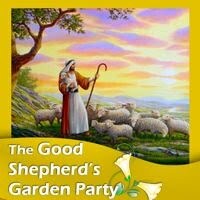 For those of you with children, last year Charlotte and I put together plans for celebrating the 50 days of Easter with a weekly Good Shepherd Garden Party for our children and would love for you to join us! The recipes and Bible readings for the first two weeks can be viewed and downloaded here and here. Charlotte has also illustrated a set of 50 printable symbols, for anyone that wasn't able to order a Sticker Calendar or, like my children, would like to color their own set, in addition to using the daily stickers! Beginning next Monday (and continuing each Monday throughout the Easter season) we will post a Mr. Linky, here at Catholic Cuisine, for whoever would like to share the pictures from each week's Garden Party! 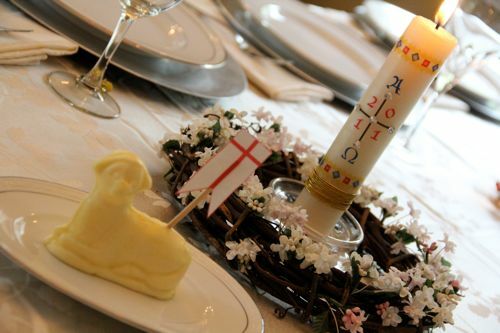 In the meantime, we would love to see what you served for Easter! 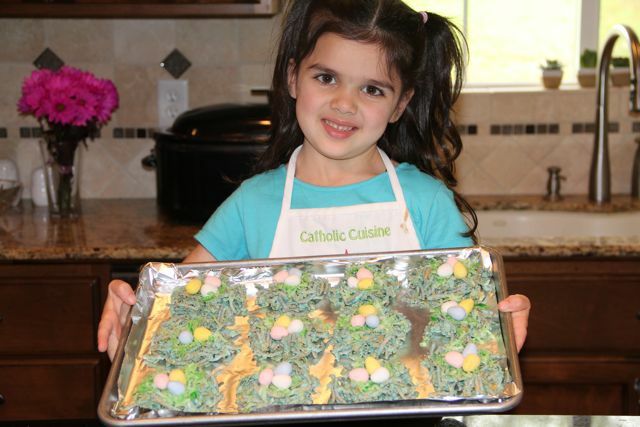 Please post your pictures (and/or favorite Easter recipes) and add a link to the bottom of this post. Saint Catherine of Sienna Exchanging Her Heart with Christ " by Giovanni di Paolo, part of a three part altar panel, hangs in the Metropolitan Museum of Art in New York City. St. Catherine of Siena is assigned the virtue of faith for the Little Flowers Girls’ Group. I decided to make this cupcake in honor of St. Catherine of Siena and the virtue of faith. I found the idea at Skip To My Lou. Bake cupcakes as desired. I used a box mix of yellow cake. Frost the middle of the cake with chocolate frosting. Dip the frosted cupcake into chocolate puff cereal. * Don’t worry too much about the edges because you will be able to cover up any imperfections with the yellow icing, in the next step. *Save this step for later if you plan to refrigerate the cupcake. If not, the cereal will loose it’s crunch and become stale. Using a star tip, frost around the chocolate top of the cupcake with buttercream frosting that has been dyed yellow using Golden Yellow gel icing color. 1 batch of the buttercream frosting is enough for approximately 36 Faith Cupcakes or 1 dozen traditional cupcakes. Slice butter into large bowl. Cream shortening and butter with electric mixer. The frosting should be creamy in texture and easy to pipe, but stiff enough to hold shape and not move off the cupcake. The more you whip the frosting the more air you add to it and the creamier and fluffier it will be. Refrigerate in airtight container, this icing can be stored for 2 weeks. Rewhip before using. I just realized that I never did get around to posting about the last of the Easter Symbol Candies that I included in my children's Easter Baskets. 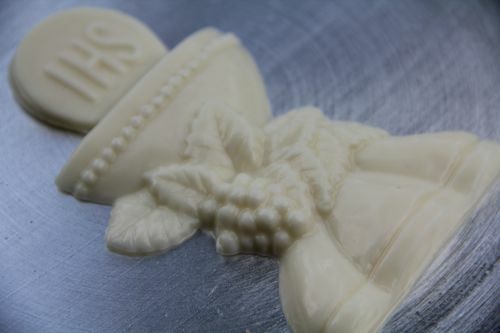 Originally I had planned to save this candy mold to make for on top of a cake to celebrate our my oldest daughter's First Communion later this year. However, after trying it out when I was making all the other candies, I decided it did tie in nicely to Easter as well. 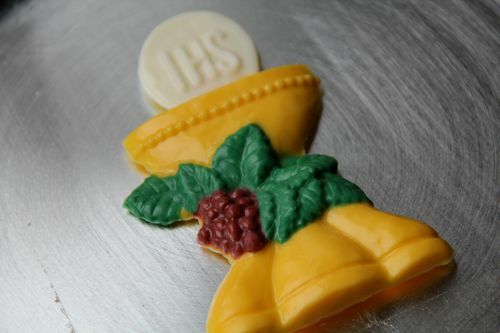 We used two quotes to go along with this "Bread of Life" Candy - one explaining the symbols of Bread and Wine/Wheat and Grapes and the other explaining the IHS symbol, both from ICC Religious Education. 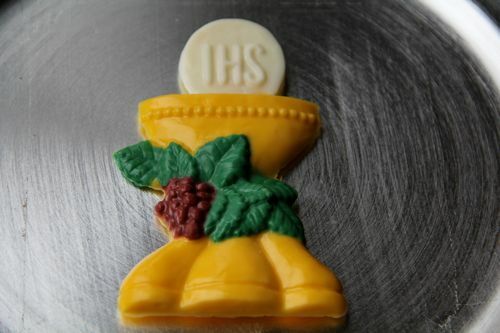 Bread and Wine/Wheat and Grapes: Because of the bread and wine they produce, the symbols of wheat and grapes are often used to designate the Eucharist. Bread is the basic food of every culture and of every age in human history. Made from the toil of human hands, the many grains of wheat are transformed and become one to nourish and sustain us. A meal, in which bread is broken and shared, becomes a means of bonding human beings together. This is the sign Jesus used to describe Himself as the "Bread of Life." Following His command, in faith we take and eat this Bread, His Body, and become one with Him." From ancient times wine is associated with banquets, joy and celebration, a gift of God to gladden our hearts. The grapes, like the grains of wheat used for bread, are fruits of the earth and give of themselves in order that we might celebrate and be glad. This sign which Jesus used for His Blood, speaks to us of giving and of sacrifice in order that we might enjoy the benefits of His love in the banquet which is the foretaste of heavenly joy. IHS: IHS stands for the first three letters of the name Jesus in Greek. For my first attempt, I used a few different color candy melts: White, Green, Yellow, and a mix or Red and Light Blue to make a Burgundy for the Grapes. This took a little time, as I patiently waited for each color to set. 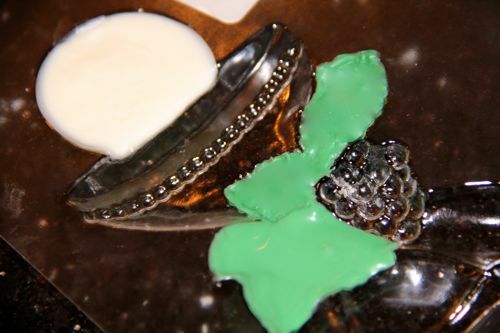 I did have a little trouble getting all the air bubbles out of the beads around the top of the chalice, but poking a toothpick through the chocolate (searching for each bubble to pop) was a quick and easy solution. As you can tell from the pictures, I didn't do the best job on keeping the colors exactly where they were suppose to be, but I still thought it turned out lovely! Another, much easier, variation would be just to use all white Chocolate. To make the next chocolate literally took just a couple minutes to fill the mold and shake the air bubbles out. Be sure to put a little extra chocolate at the top of the chalice to prevent breakage, and also be sure to let it set completely before removing it from the mold. I think this solid white one would look so pretty on top of a soft-pink frosted cake for my daughter. You can find other ideas and recipes for celebrating First Communions in the archives! Back in 1999, during a visit to his old home town of Wadowice, Pope John Paul II mentioned that he was very fond of the cream cake (or kremówka) that, as a child, he and his friends in school would buy from one of the bakers in the town's market after putting their money together. 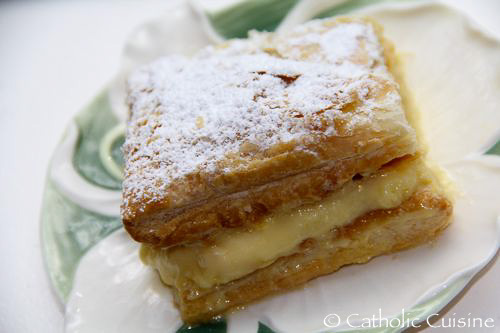 The next day the entire town was arriving with kremówka, suddenly renamed Kremówka Papieska, the "Papal Cream Cake. I have been meaning to make this cake for a couple years now, ever since running across the story and recipe at European Cuisines! 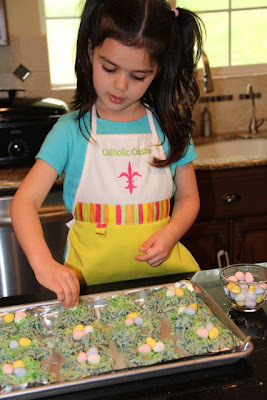 With the Beatification of Pope John Paul II coming up on May 2nd, Divine Mercy Sunday, I am finally going to try it out and thought I would share the recipe now, in case any of you would like to prepare it this weekend as well. Grease 2 - 8" or 9" baking pans, coat with bread crumbs and set aside. Cut the butter into the flour with a pastry blender. Beat the egg yolks into the water: mix into the flour. Mix well. Divide in halves and spread/press each half to completely cover the bottom of one of the baking pans. Bake for approximately 30 minutes in a medium-low oven (325F / 160C): remove and let cool. Remove from pans when cooled. Bring to a boil and continue boiling for 3 minutes. Pour cream into a bowl and let cool. Stir occasionally until cold. If you like a thick layer of filling, make a double batch of Easy Pastry Cream. Using a 13x9-inch pan as a mold, place one layer of cooked puff pastry in the bottom of the pan. Pour hot pastry cream over it, and place second layer of cooked puff pastry on top. Refrigerate until set. When ready to serve, using the prescored marks as guides, cut into 9 pieces. 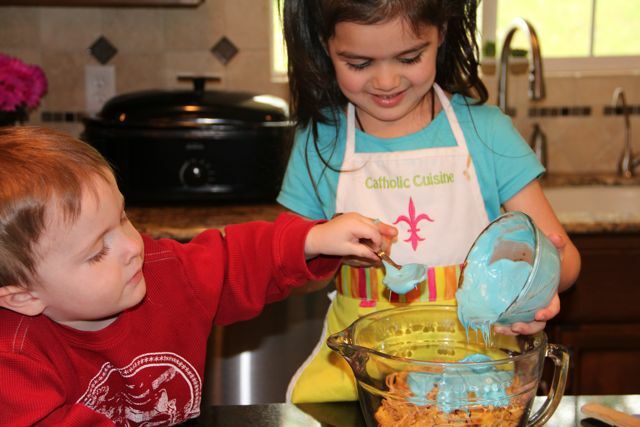 Dust each piece with confectioners' sugar. Refrigerate leftovers. If not using the pastry cream hot as in Polish Kremówka Papieska, place a sheet of plastic wrap on the surface of the pastry cream which is cooling in the ice-water bath, and top the plastic-wrapped surface with a layer of ice cubes. Leave the ice cubes in place until the cream cools. Cover and refrigerate for up to 3 days. And yet another variation can be found at Cafe Galicja, which is located in Pope John Paul II's hometown of Wadowice, Poland! 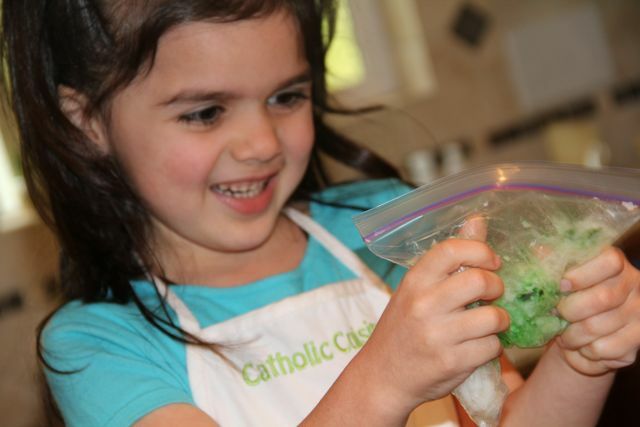 Additional recipes, to honor Pope John Paul II, can be found in the archives, as well as recipes for Divine Mercy Sunday! "Christ has risen--He has risen indeed!" Mix all ingredients together and beat on high for 5 minutes. Pour into greased bundt pan and bake at 350 degrees for 45-50 minutes. 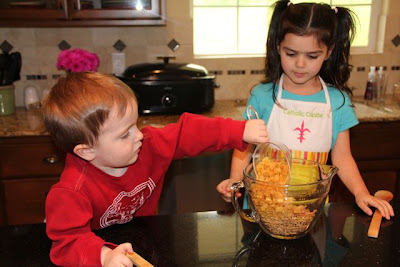 This morning we started making the treats for tomorrow! We started with a batch of Chocolate Nests followed by a Chocolate Crown of Thorns. 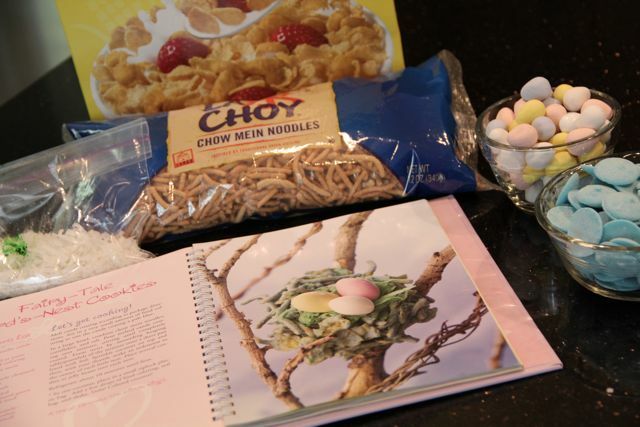 Then we decided to try make a few more nests slightly modifying a recipe from the Fairies Cookbook , Fairy-Tale Bird's Nest Cookies! They turned out so cute and I thought I would share the recipe with you all real quick. In a large bowl, combine chow mein noodles, cornflakes, and salt. Pour melted candy over the mixture, stirring until completely coated. 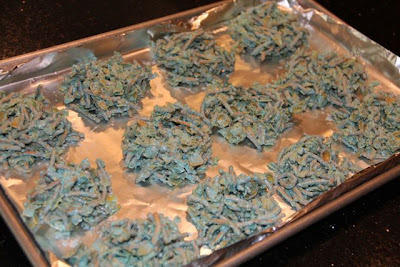 Form nests by mounding heaping tablespoonfuls of the mixture onto a sheet pan lined with foil. To tint coconut, place it in a small ziplock bag. 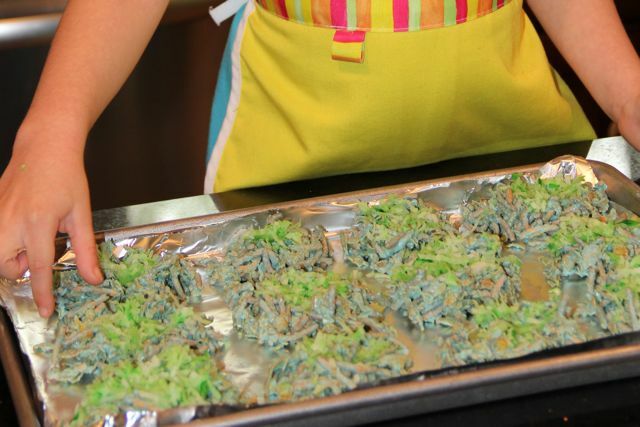 Add a few drops of food coloring, seal and shake! 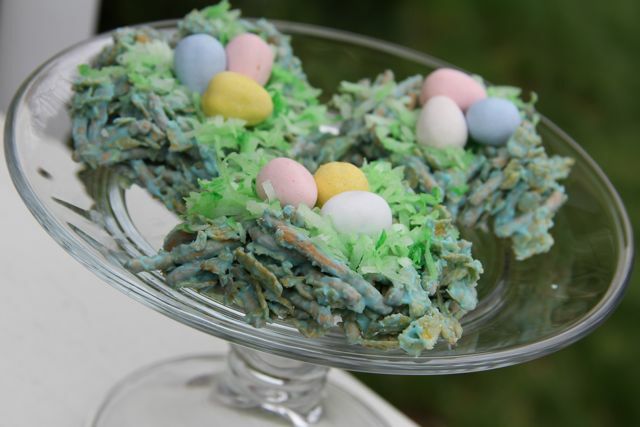 Sprinkle the coconut on top and then, with your thumb, make an indentation in the center of each nest. Place several candies into each nest. It's "A treat to make the birds sing!" The following recipe was submitted by Erin, from Growing with my Girls. It would be another great option for those of you that would like to make a Lamb Shaped Cake for Easter but do not have a lamb shaped pan. Thank you Erin! I thought I'd share this Easter lamb cake - no special pans needed. I made this cake last year for Easter Sunday for the first time, and I think it will become a family tradition! Set a fine mesh strainer or colander over a bowl and line it with a linen towel. Pour the coconut milk into the lined strainer and let the coconut water drain for up to two hours, until you have a thick lump of coconut cream. After it has drained, cream the butter with 2 cups confectioner's sugar in a large bowl. Beat in the salt and vanilla or coconut extract until smooth. Add the coconut cream and mix, scraping the bottom and sides of the bowl. Add remaining confectioner's sugar until you have a smooth, spreadable frosting. Cover and keep at room temp until ready to use. **Note: Last year I found a little box of coconut cream at our local health food store and used it rather than draining a can of coconut milk. I added it a few spoonfuls at a time until the taste and consistency were good. The frosting came out thick but spreadable, and very good. This option allows you to skip the draining step if you can find coconut cream at a local store. I can't find it this year! Preheat the oven to 350 degrees. Grease and flour a 9 x 13 inch pan. Place the coconut and all-purpose flour in a food processor. Process for thirty seconds and set aside. Cream together butter, baking powder, sugar, salt, and extracts in a large bowl until light and fluffy, at least five minutes. Add egg whites one at a time to the butter mixture, beating well after each. Stir a third of the whole wheat pastry flour into the creamed mixture, then half the yogurt, another third of the flour, the remaining yogurt, and the remaining flour, scraping bowl thoroughly. Add the coconut-flour mixture and stir until batter is evenly mixed. Transfer to prepared 9x13 inch pan. Bake approximately 30 minutes, until the cake begins to pull away from the edges of the pan. Cool on a rack for 15 minutes before removing from pan and then cool completely. The cake may be frozen for 30 minutes before frosting to make assembly easier. I cut the cake freehand with a serrated knife, but I looked at the shape drawn on page 62 in the little book Lent Begins at Home . You can see in the picture above that I used some scraps from the top edge of the cake to form an ear and the tail, which I then put in the appropriate places before frosting. The cake can be put back in the freezer briefly if desired, so the crumbs from the cut edges will be less of a concern. Spread frosting all over the lamb and then make a face using two chocolate chips for eyes and a pink jelly bean (you can probably snitch one from the kids' Easter candy! ;) as a nose. The optional coconut listed at the end can be sprinkled over the frosting. This gives the lamb cake a woolly, textured appearance, like in the photo below, which was taken without a flash and more clearly shows the coconut on top.